Cretes capital is a vibrant mix of ancient and medieval history, outstanding museums and enticing shopping and restaurants, all topped off with the ancient Palace of Knossos, located just outside town. 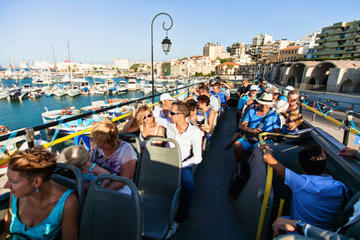 With all this to discover, a hop-on hop-off bus tour is one of the best ways to get to know the city. With your 1-day ticket, board the open-top bus at any of the 10 stops and spend the day hopping off and back on again at any of the stops you choose. See the Itinerary for the full list of stops. Ride the bus to Knossos and spend time exploring this fascinating site, where the palaces and courtyards of Cretes Minoan capital stood between around 3400 and 2100 BC. Wander around the relics of the chambers of King Minos, and conjure up visions of the mythical beast, the Minotaur, that reputedly roamed a labyrinth here. Admire other top Heraklion attractions including the 16th-century Koules Venetian fortress on the harbor front, and the old city gates. Or hop off to visit Heraklion Archaeological Museum, the Natural History Museum, or the grave of Cretes beloved 20th-century writer Nikos Kazantzakis. Enjoy unlimited use of your ticket throughout the day, hopping on and off whenever you wish, however many times you wish. Buses depart from each stop on a regular basis, so you can explore at your own pace. End your tour whenever you want at any stop  its up to you!